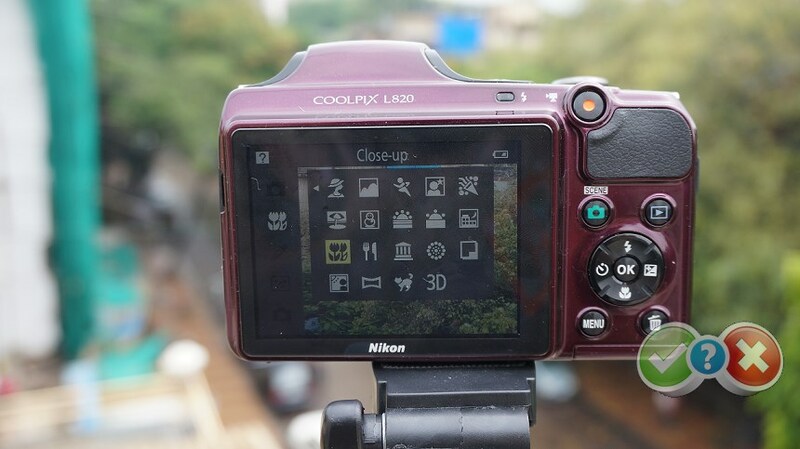 The Nikon Coolpix L820 has the look and feel of a small DSLR. It has a chunky rubberised hand grip and a rubber pad on the rear for your thumb , it feels great in the hand and sticks to the inside very firmly. 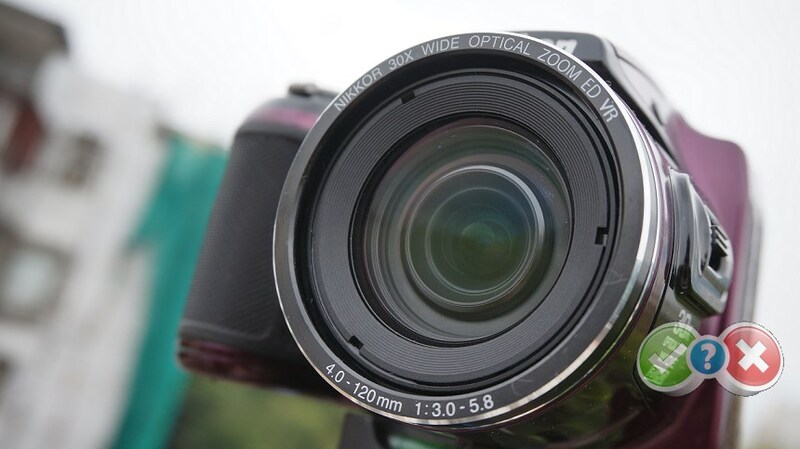 The camera comes supplied with a lens cap, but you have to make sure you remove it before switching the camera on as the causes a lens error warning to pop up on the screen. 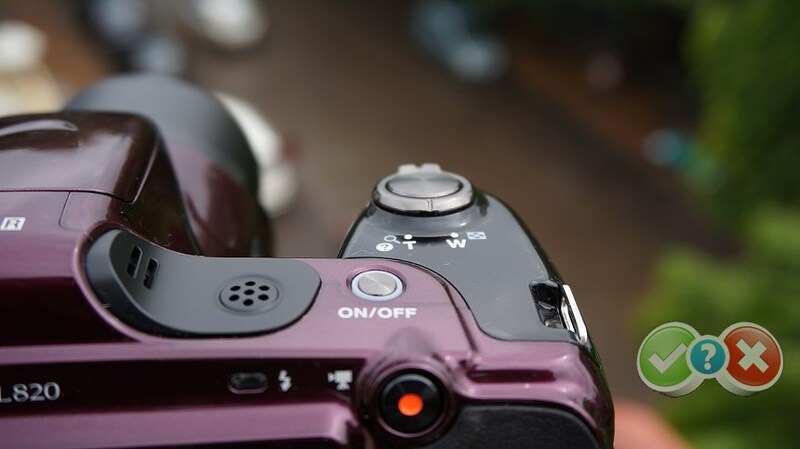 You can view your pictures with the lens cap on, just press and hold the playback button when the camera is off. On the lens module is a switch for changing the focal length, you can also adjust the zoom using the zoom rocker. On the top of the camera there is a button to activate the pop-up flash and on / off button. On the back are movie record, scene mode, playback, menu and delete buttons as well as a d-pad and OK button for cycling through the camera menus. 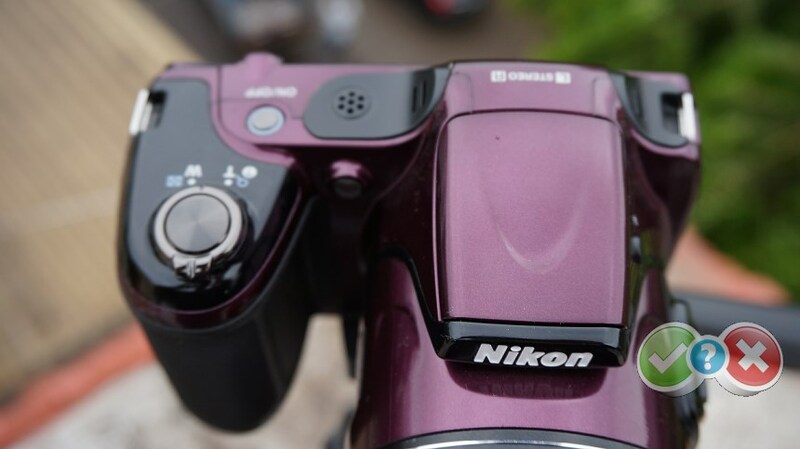 The buttons on the d-pad can be used to set the flash, self-timer, exposure compensation and macro mode. Battery life is rated at 320 shots according to CIPA test results when using alkaline batteries, so you’ve a good chance of a day or two shooting before requiring a change, although this will depend on the quality of batteries you purchase. You can get 870 shots if you use lithium batteries instead. Although , the box comes packed with all the necessary batteries that you need(4 X AA). We took a number of shots to test the camera’s responsiveness, from switch on to first photo, shot to shot, focusing speed etc. We take a number of shots and then use the average to ensure accurate and consistent tests, making it easy to compare with other cameras. The camera can shoot FullHD video at 30fps and also comes with stereo recordings. The auto focus works really well in both still and video modes. The flash is good and does not burn out pictures like in most entry-level cameras and phones. However, use the flash sparingly as this camera uses four rechargeable cells that tend to drain out much faster than a Lithium-ion equivalent. White Balance Performance – Under the incandescent lights, the auto white balance (AWB) and incandescent preset perform well, taking almost identical images. Under the fluorescent lights the Auto White Balance performs well, with a magenta cast when using the fluorescent preset. The image stabilisation is impressive, even at the long end of the zoom. However, do all your 30x shooting with a tripod. 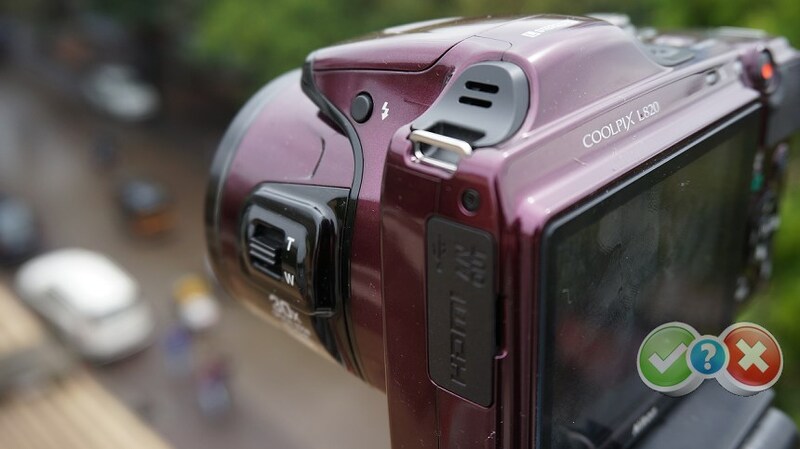 There are zoom toggles on both the lens and the trigger which is good while shooting different orientations. There is no viewfinder and the LCD has a VGA display. So the image appears a bit too electronic, but trust us the results are much better. The lens incorporates ED (Extra low Dispersion) lenses to keep images as sharp as possible. The Vibration Reduction (image stabiliser) is lens based which is good news. It’s always good to get a hardware option over software. The L820 uses a lens-shift system which moves the lens in real time to counteract any movement while the picture is being taken. Panorama mode – You can shoot 180° and 360° panoramas, they have a good amount of detail and are stitched together well. Effects – In the playback menu, you can edit pictures to add the digital effects. That’s useful if you’ve taken a picture in a rush or change your mind about editing. You can add D-Lighting which is Nikon’s dynamic range boost. Other effects include , Toy Camera , Fisheye , Auto-correct and many other useful ones. This would fulfil if you are one of those who has a sweet tooth for instagram. 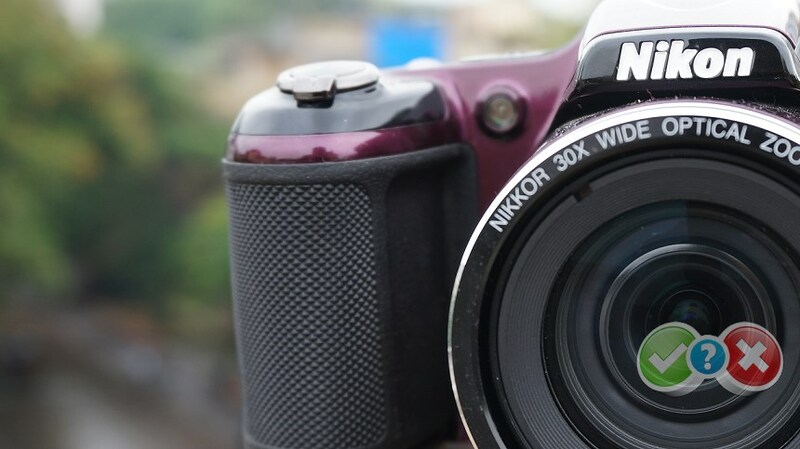 Although the Nikon L820 may be mistaken as a compact DSLR , it isn’t and what it means is that the lens cannot be inter-changed. Having a look at the lens performance, detail is good at both ends of the lens, although a little soft in the corners. 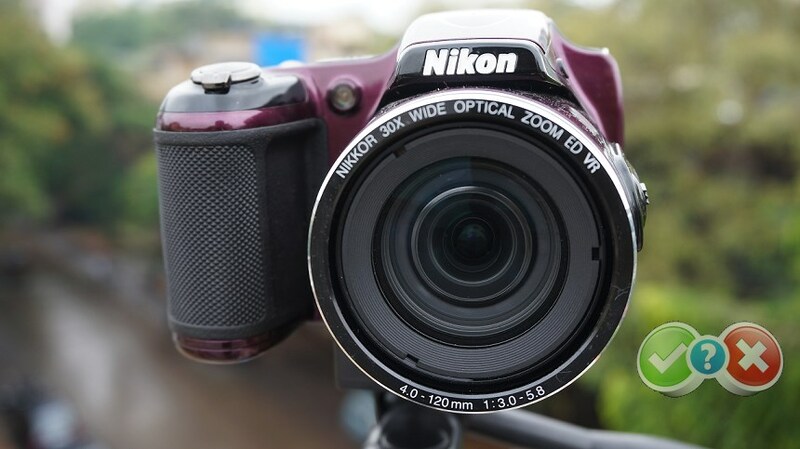 The lens has a minimum focusing distance of 1cm which allows for a good macro shot to be taken and thus using this camera for shooting macro , high-zoom and close focus objects would be a delight . The great thing about superzooms is that they’re larger, so the accessories are upgraded. You get a lens cap and instead of the wrist strap, it comes with a neck strap. You also get a USB cable and television leads. Nikon supply 4x AA batteries to get you started, but it’s a joy while using it with rechargeable ones. The documentation consists of a Quick Start guide. It looks quite big but is, in fact, in multiple languages. 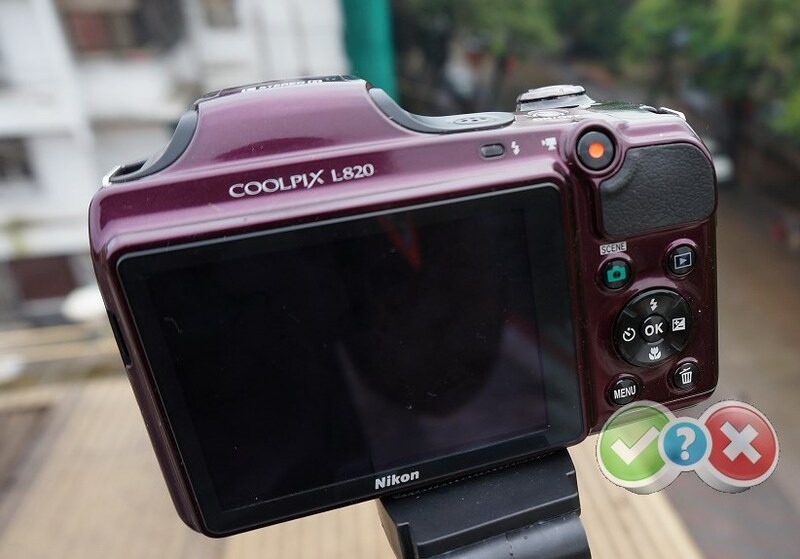 The full manual is on the enclosed CD along with Nikon View NX2 – a basic editing and tagging software program. At around 13 thousand INR you simply cannot go wrong with this camera, it is the very best at delivering a premium quality experience while placed in a mid-range segment but quite stunningly delivering high-end performance. The three primary USPs that the Nikon L820 can boldly boast are excellent ergonomics, great 30x zoom , variety of shooting modes with excellent low light capabilities. if you are planning to get a camera without and would like the camera and its processor to select whats the best lens setting automatically , we recommend this camera to you . In many ways then the Nikon L820 liberates the photographer from middling with details and lets them take control of the perfectly timed moment.